Cooking Delights: Hummus is Hummus, Right? Wrong! Today I made the creamy hummus from Vive le Vegan. It was delicious! This hummus has just a little bit of toasted sesame oil in it. This has a huge impact on the flavour. I used the hummus to make Vicki's Hummus-Quinoa Casserole, also from Vive le Vegan. The casserole was so delicious, I was actually surprised. I have looked at this recipe several times but didn't think to make it. I guess now that I am over my fennel bulb fear I am trying the recipes with fennel in it. The flavour of this casserole was absolutely delicious. 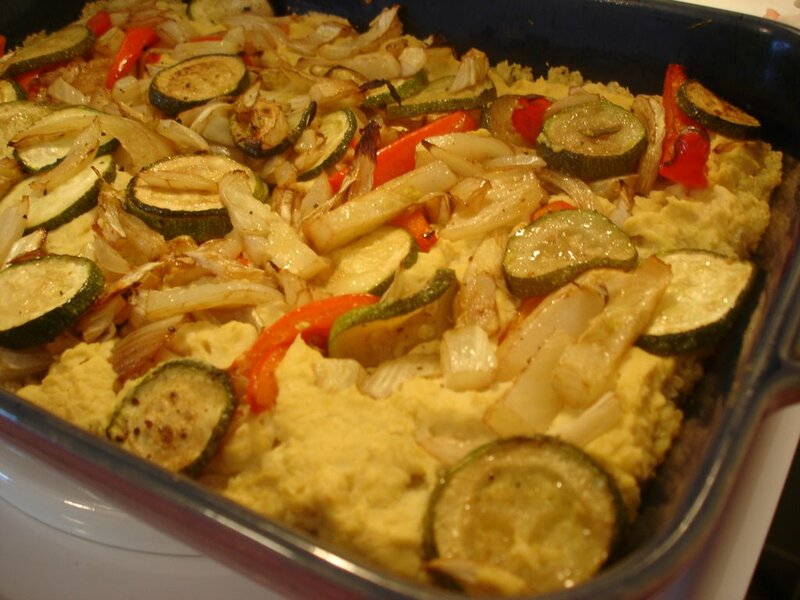 The hummus, quinoa and roasted vegetables make a perfect nutritionally balanced meal. "Quinoa is a high-energy grain that, because it is easy to digest is an ideal endurance and fitness food. The United Nations World Health Organization reports that quinoa is at least equal to milk in protein quality. Quinoa has the highest protein of any grain (16 percent) and, unlike other grains, is a complete protein with an essential amino acid profile similar to milk. It contains more calcium than milk!" (Wood 1999, 279). I served the casserole with a green salad. 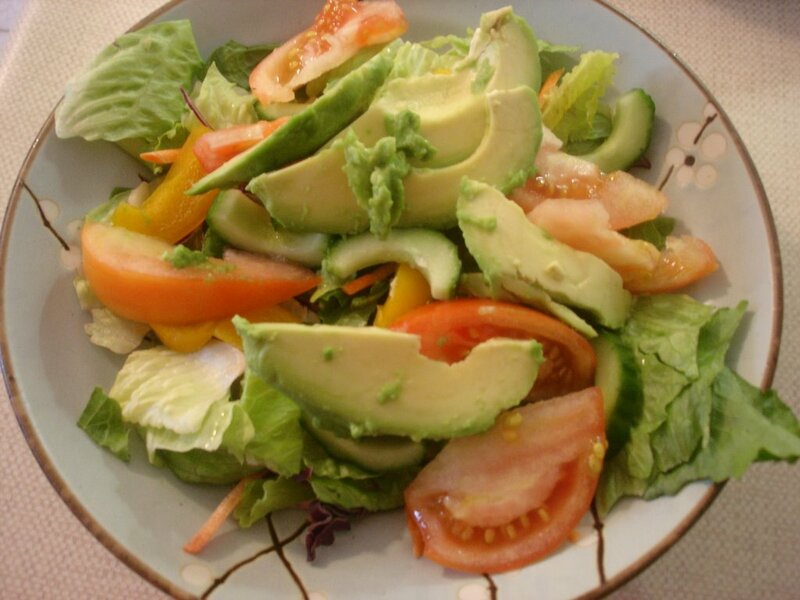 The salad is garnished with yellow pepper, avacado, tomato, and cucumber. Raw foods helps to digest your food. Avacados are a good source of monosaturated fat, protein, potassium and vitamin E.
Whoa, you're a busy girl....that casserole looks really good. Sorry I missed you yesterday, Aurora had the flu. I've never eaten fennel (bulb) before...what does it taste like? Sorry I have been MIA lately on my blog I was exhausted from my other job. I spent yesterday sleeping!! So today I made up for it and posted two new blogs for you. I am bring both the pants and shirt for you to try on I know you are going to love them!! Can't wait to see you! Hi Nancy - you didn't miss me, I was home with the flu too! Aurora and I must have run into the same nasty bug. Fennel bulb is amazing. I only tried it for the first time a few weeks ago. It has a subtle licorice flavour. It tastes really nice roasted like this. You can also chop it up and put it over salad raw. I had my Dad really guessing last time I did this when he was over for dinner. He said, "what is this? is it celery?" Hi melissa - I skipped over this recipe a number of times for the same reason. I am so glad I finally tried it. I am thinking about trying the hummus pizza now too. The warm hummus was really quite nice. Hi Jewell - Thanks for updating your blog. I had really been missing my fashion plug. Hi Vicki - no, no I *love* your blog! All those adorable pictures of your beautiful girls enjoying their food. You have given me some great ideas for cook books for my daughter for Xmas! That casserole does look good... I've been skeptical of trying cooked hummus, but maybe I'll have to try it soon. I've also had a fear of fennel, but you seem to be doing okay with it so I guess I should give it a second chance!